I have never felt excluded, harassed or threatened at a tech conference or hack. But I’m also not a member of a minority or otherwise marginalized group in technology. I’m a white male living in western Europe. So when it comes to promoting diversity and inclusiveness, I am out on a limb and I recognize this. It doesn’t stop me from working as hard as I can to ensure that the endeavors I’m involved in are as diverse and inclusive as possible. These days we are all doing a lot of hand-wringing about diversity in STEM, diversity in technology conferences, diversity in technology education, diversity in the technical standards community. I can’t think of a single thing I’m involved with in which the topic of diversity (usually but not always primarily gender diversity) has not come up, and rightly so. I personally believe that we all hold biases (for example, the much talked about mirrortocracy of Silicon Valley) and that we all need to work hard to overcome these biases. 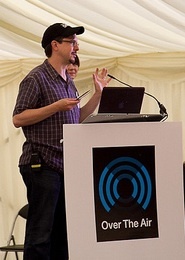 At Over the Air we try to put together a diverse set of speakers which we believe helps to create a welcoming and inclusive environment. Another concrete action we have taken this year to promote inclusiveness is to put in place a code of conduct for our event. We have done this in a very webby and open source way by explicitly referencing the Hack Code of Conduct, a document that has been developed and signed by a number of hack event organizers from all over the world. We intend to run our next event and future events according to this code and to make sure the code is visible and understood by participants, our staff, our venue and our sponsors. When I announced this on Twitter, I was immediately asked “Why are you doing this? Have you had problems in the past?” The answer, thankfully, is mostly no. Our attendees have largely been positive and respectful of each other and we appreciate that. Of course, there may have been problems at our past events which went unreported or which were reported but went unrecognized. We think having a clear code of conduct will help to set the baseline behavior our event and we don’t see any problem with stating this up front. Quite the opposite. In 2013 we actually did have a problem where a disabled attendee was denied access to disabled parking (effectively turned away) by venue security staff. Would a code of conduct have helped in this case? It’s not clear, but making clear the existence and nature of such a code up front may have led to more awareness of these issues which may have prevented this incident from taking place. Our event brings together people from many backgrounds and bunches them together in a confined space over-night, sharing shower and toilet facilities. And beer. It’s not inconceivable that inappropriate behavior could result. What this code of conduct does is to make it clear that disrespectful behavior, behavior that makes anyone feel uncomfortable or harassed, is not acceptable and will result in you getting chucked out of the event. Just something to keep in mind. Ashe’s Dryden’s Codes of Conduct 101 + FAQ post was very influential in my thinking on this. In fact, reading Ashe’s post changed my thinking from “I don’t think we need one, but we’d better have one anyway” to “we need one and we need to be very clear about it.” I particularly like her answer to the question “If I suddenly put up a Code of Conduct won’t people think we’ve had incidents and feel unsafe?” I strongly suggest giving this a read. I would also like to give credit to Soledad Penadés, Linda Sandvik and FJ van Wingerde who have all done a lot of tweeting and blogging on this topic as well as encouraging diversity in tech.